Reading Journals Always Bring a Smile! Softcover small notebook, professionally designed lightweight journal makes a unique gift idea for book lovers. 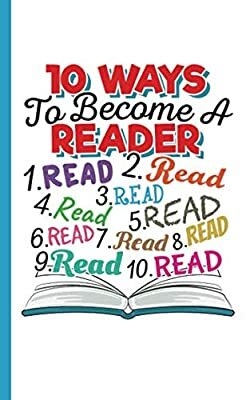 Cute 10 Ways to Become a Reader teacher librarian quote with list of read, read, read! Encourage and inspire preschool, kindergarten or Pre-K. Motivational! Inspirational! Use as a writer's journal, office exchange party gift, or for the desk of any academic University or High School student. 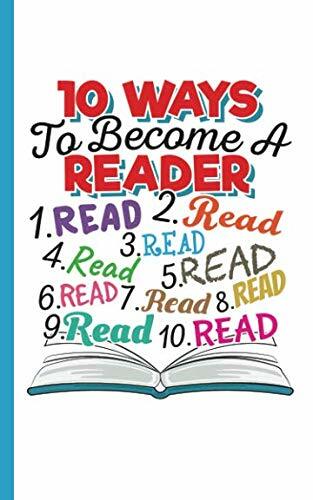 Record your travel memories, training thought quotes, lesson reminders, or success stories Works best as a birthday, retirement, thank you, or Christmas gift for anyone who loves to read, teaches English, librarian, primary or elementary education school professional.